For the first installment of Iron Fist 101 I wanted to cover a few things. Those early issues, the ones we’re starting with, will have a lot of black and white pictures. I don’t own the originals; I own the phonebook sized Essential Iron Fist. When I can find a colored version of the page or panel I want to show off I’ll use it, but there will times I’ll have to use the black and white issues. These Essential black and white pages also lead into the early Power Man and Iron Fist book which we will be covering. The last thing I wanted to mention about this before we get started is this project is going to take a long time. Some times (like today) I’ll talk about a single important issue, other times I’ll cover a few issues. My Iron Fist library is pretty large and I honestly expect to still be doing Iron Fist 101 this time next year. With all that said, let me get started at the beginning. And Facing you, four others edge closer, searching for an opening – a moment of weakness – the careless flickering of an eyelid. For, this is your Day of Destiny, Iron Fist. You will eat of the fruit of the Tree of Immortality – or else drink deep of the Elixir of Death--! That’s a lot to take in. We have Iron Fist fighting four other people while the hooded Yu-Ti watches on with the Dragon-Kings who wear masks that look to be scaled like a dragon’s skin. Yu-Ti seriously looks like the hooded Cobra Commander. Starting in Marvel Premiere 16 Larry Hama will actually take over art duties, so I would think it’s pretty safe to say the origin of Cobra Commander’s hooded design start with Yu-Ti. Iron Fist defeats the four men easily and at which point Yu-Ti tells him to think about himself before facing the next challenge. And here is where the flashbacks start. We learn that ten years ago a nine year old Danny Rand was tracking across the “snow-crusted Asian wastes” with his parents (Wendell and Heather Rand) and his father’s business partner Harold Meachum. Wendell wants to take them to the city of K’un-Lun. As they are crossing a ice bridge Danny and Heather fall down to a lower ledge. Wendell begins rescue his family when Harold betrays him. Literally digging his boots into Wendell’s hand until the older Rand has to let go and fall to his death. The book makes sure we see that he bounces off his head in a bloody mess on his way down too. Harold wants to save Heather and Danny; in essence he wants to steal Wendell’s family and his half of the company. Heather is willing to die instead of joining the man who just killed her husband, so the first part of the flashback ends with Meachum leaving them on the ledge. 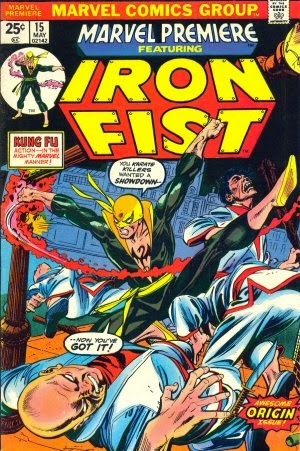 Iron Fist snaps back to the present to face a giant masked fighter Shu-Hu. 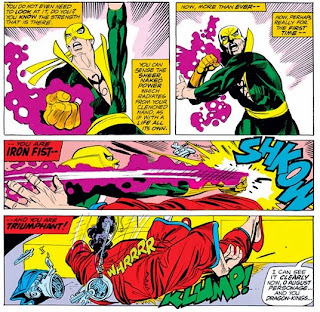 We are told Shu-Hu is “He whose lips are pledged to silence and whose name means lightning…and whose fists are like twin thunder bolts!” Iron Fist hits on the giant seem to have no effect and Shu-Hu is as fast as he is strong. As the hero of the book struggles to fight his opponent he returns to his flashback. Danny and his mother make the climb to safety and then start through the snow. They don’t know where they are going and find themselves being tracked by a large pack of wolves. They finally find a rope bridge and head for it. Halfway across Heather realizes that the wolves will overtake them soon. She sends Danny further across while she charges the wolves. Moments later a mysterious group of archers show up and shoot the wolves, it is too late for his mother. At the age of nine Danny has seen his father’s head cracked open on an icy mountain and his mother eaten by wolves. Take that Batman. Back to his challenge, Shu-Hu shoots a dagger out of his palm and hits Iron Fist in the shoulder. The thought of his parents drives Danny into a rage and he begins kicking and punching Shu-Hu. Finally he focuses his chi into his hand until it becomes “like unto a thing of iron.” This punch takes off Shu-Hu’s head and reveals that his opponent was actually a robot. Iron Fist stands triumphant and we are told that he will now have to choose between immortality and death. We have to wait until the next issue for that though because that announcement is where Iron Fist’s first issue wraps up. A lot happens in the first issue. There are crazy names, crazy masks, a super dark origin story, and a robot. 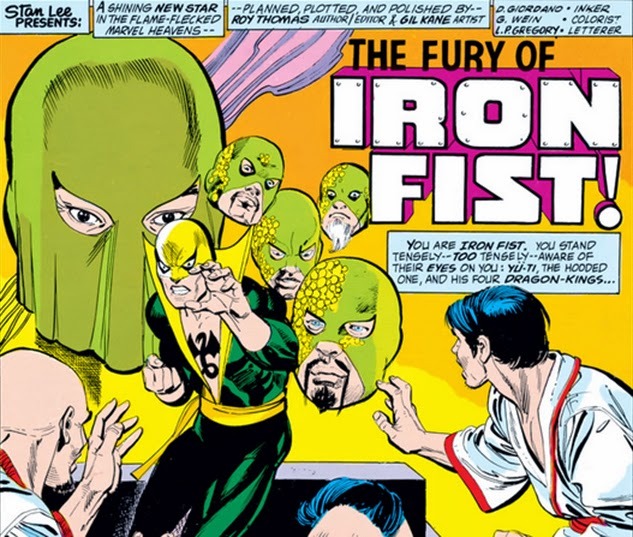 One of the other interesting things in his issue is that in about half of the panels you can see Iron Fist’s eyes when he is wearing his mask. Check back next week for part two of Iron Fist 101.